1. First we need to prepare the workpiece. 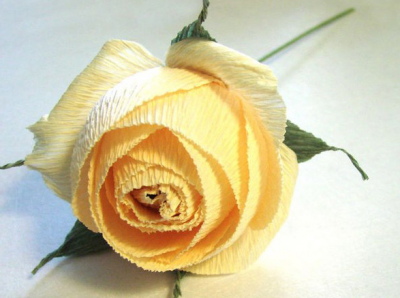 For this purpose it is necessary to choose a color for our rose and to cut seersucker paper of the necessary shade in the size 7 x 5.5 cm-it will be our petals. The more billets we prepare-the more lush the rose will look. 2. Now you need to stretch across our workpieces it is necessary to give them a bend and shape. 3. Then we make a blank, using a paper of green color (look at the picture). Such a trick will give our rose realism. 4. At this stage it is necessary to connect a stalk of a rose with its petals. Carefully wrap the blanks of the petals around the ball or candy and fasten them with a thread to the stalk. 5. Now you need to give the wire more similarity to the stalk. For this we take the paper of green color and wrap it with wire. After that attach on a colour or double-sided tape green blanks of leaves. That’s it! The paper rose is ready. If you want to make a whole bouquet of such roses, repeat all the steps necessary number of times. To make the bouquet look more cheerful, you can use paper of different colors.